What can I say? I started reading the series in 2009 lured in by the promise of dragons. And oh boy did this series deliver! I fell in love with Temeraire, Maximus, Excidium, Lily, and their captains. But all good things must come to an end and so it is with this series, too. If you’ve enjoyed the series so far, I believe the ending won’t disappoint. It had some things which I expected, a few which I didn’t, and it’s bittersweet, much like the series as a whole. In fact, I kind of want to reread it now, knowing where things will lead. I’m happy with this ending, although I’d love to see more of this world. 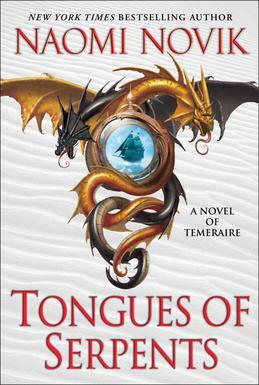 The sixth book in the Temeraire series. After the events in the previous book, Victory of Eagles, Laurence and Temeraire were sent to Australia. Because of Temeraire, Laurence is treated differently than the other prisoners but almost all of the aviators and the officers resent him, except of Iskierka’s captain Granby, the young boys from Africa, and Laurence’s unofficial ensign Emily Roland. After a long sea voyage, Temeraire, Iskierka, and the three eggs sent with them have arrived to Sydeny which turns out to be not only a small and shabby town but also under a mutiny. The prisoners have overthrown the current governor and are running the town themselves. The previous governor begs the newcomers to interfere and put him back in charge. However, both Grandy and Laurence refuse without direct orders, and so does the ship’s captain Riley. So, instead the newcomers have to deal with the rebel leaders and the haphazard order of Sydney. Laurence and Temeraire are both frustrated since they have nothing to do and they hear that the war is escalating. The colony is also hard pressed to feed the huge dragons who have to settle for stringy kangaroos. When one of the rebel leaders suggest that the dragons and their captains might fly on an expedition into the unexplored (by British, at any case) interior of the continent to search for a better land to grow cattle, the dragons and the captains are eager to go. However, that proves to be more dangerous than they expected and not just because of the climate. Before the expedition leaves, one of the three dragon eggs hatches. Even though the three eggs are thought to be of relatively little value, the Admirals sent some officers whom they thought would make good captains for the hatchlings. One of the officers was Rankin, from the first book, who was a dismal captain to the poor small Levitas. Temeraire objects to him strongly, especially after he learn that Rankin was going to force the hatchling to “choose” him. However, the hatchling chooses Rankin because he’s an earl’s son and rich. The new hatchling calls himself Caesar and complains quite a lot. Temeraire carries the other two eggs with him during the expedition but the larger one is stolen despite his efforts. Quickly, the journey changes into a rescue operation. Most of the book is devoted to exploring Australia and then to the rescue effort, so there aren’t big battles except at the end. I didn’t mind since I tend to like exploration more, anyway. There were a few things that I thought a bit too convenient, but not enough to really grumble about. Laurence, and to some extent Temeraire, are again presented with moral dilemmas: first with the situation with the colony and later with having made friends among people who might become the enemy. Considering, who appallingly Laurence has been treated by Whitehall, I couldn’t blame them if they decided to show Whitehall the finger and settle in China. This was again pretty different book from the previous ones but I liked it for the change of pace and I’m really curious to see what will come next. However, it ends is such a way that it’s possible to stop reading the series here. There was a mention is acknowledgments that there will be three more books. At the end of the Empire of Ivory, Temeraire and Laurence became traitors to England. Now, they are paying for it; Temeraire has been confined to the breeding grounds in Wales and is bored while Laurence is a prisoner aboard the warship Goliath. There’s little to do in the breeding grounds but to sleep, eat, and mate, but Temeraire has decided to be at his best behavior so that the government won’t execute Laurence. None of the other dragons are interested in discussions and it’s very hard to get any news. The only thing the other dragons seem to be interested in, is taking over the nicest caves. But then Temeraire hears that Goliath has been sunk and Laurence with it. The Celestial decides to take matters into his own hands. Clearly, the humans aren’t doing a good job at fighting the French, so Temeraire encourages the other dragons to leave the breeding grounds and fight all by themselves. As a member of the Aerial Corps, Laurence has met scorn before. But even then he was a member of a tightly knit soldier unit. As a traitor, Laurence is completely on his own. People he doesn’t know, and even some who he does know, insult him and treat him badly. For his part, Laurence feels that he deserves everything and doesn’t even try to defend himself. He knows that he’s only alive because the Admiralty has still some use for Temeraire and even so he could be executed at any moment. However, soon the Admirals need Laurence as a dragon captain again because the French are moving in force. However, his sentence isn’t forgotten, just delayed. There’s an interesting mix of old and new characters in the book. Most of the new characters are dragons. We finally meet a dragon who isn’t too keen on fighting and in fact finds it not quite rational. Once again, I also quite enjoyed Iskierka; the rash fire breathing dragon who just wants to fight and win more prizes for herself and her captain. She brings conflict where ever she goes. Temeraire makes some headway in his quest for more rights to dragons. Many, especially the Admirals, consider it blackmail, though, so it remains to be seen if the rights will stay after war. This book is rather grimmer than the previous ones. The French invade England and there’s a lot of fighting, some of it rather nasty. Laurence does his duty grimly and without his previous enjoyment. This makes also Temeraire unhappy and the dragon wonders if he has done something wrong. 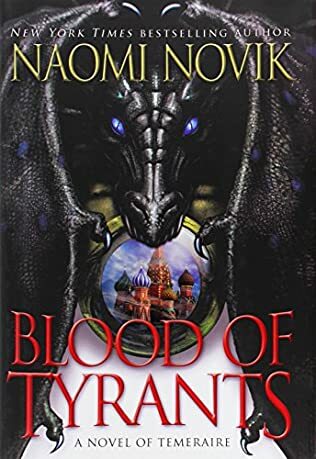 Yet, Novik’s writing style doesn’t change and there are even some comedic moments, such as Temeraire meeting a “dragon scholar” who insists that dragons are no more intelligent than dogs. I also enjoyed the brief discussion where it was revealed that the treasonous act at the end of the previous book could have been done quietly and without any treason at all. But Laurence is such a noble man that he couldn’t have agreed to sneak around. Again, there’s a twist at the end which changes the duo’s life and I’m very curious to see what happens next. Definitely a good continuation to the series. 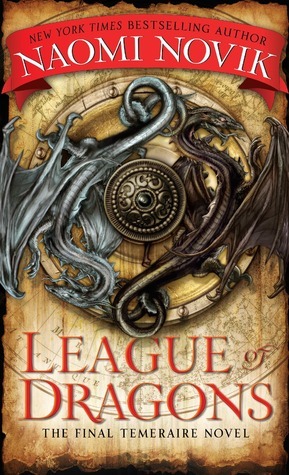 The fourth book in the Temeraire –series. It starts immediately after the previous book, Black Powder War. Captain Will Laurence, his dragon Temeraire, and the dragon’s crew have been away from England for a year. Now, they are finally coming back home after their adventures in China. Laurence is expecting rest and seeing his friends in the Aerial Corps again. Temeraire is full of notions of how he’s going to further the lives and fortunes of dragons in England. However, they are attacked by French dragons and see no sign of the English dragons who should have been patrolling. When they finally return to England, they hear the dreadful news: the dragons have contracted a disease which is likely to kill them in time. Currently, most of them are too weak to patrol and the Corps is desperately trying to keep the knowledge from the French who are likely to invade the moment they hear about it. The doctors haven’t found a cure and the best they can do is to quarantine the sick dragons. However, soon the doctors notice that Temeraire seems to be immune to the disease. It might be something he encountered in Africa on his way to China. So, a ship is made ready, and Temeraire and a number of dragons are sent hastily to Africa in the meager hope that they might find a cure. I have to admit that I liked this one best of the series so far. I loved the return of old friends from the first book and the twist that sent them all together to a new continent. Temeraire and Laurence are as entertaining as ever and there’s social commentary on slavery, sexism, and racism. The sexism is very obvious because one of the female dragon captains has been promoted to an admiral and the old boys’ club don’t know how to deal with that. However, I was surprised to notice that when Temeraire talks about having dragons sit in Parliament, nobody has pointed out to him that the English exclude half of their own people from the decision making, and so are unlikely to let non-humans in. The African adventures center at first around searching for the medicine but escalate later when the team finds a culture they haven’t known about before. I’m not entirely convinced that the culture in question could have stayed hidden so long, but I’m willing to suspend my disbelief this time. There’s a great tension between Laurence and the ship’s captain Riley over slavery. Laurence is against it (as is his father) and Riley’s family owns a plantation. The other characters are surprisingly non-vocal about it, though. Except for Temeraire who is also against slavery. There’ a great twist near the end and a cliffhanger ending. So, I ended up downloading the next book almost immediately. Ah, moral dilemmas!